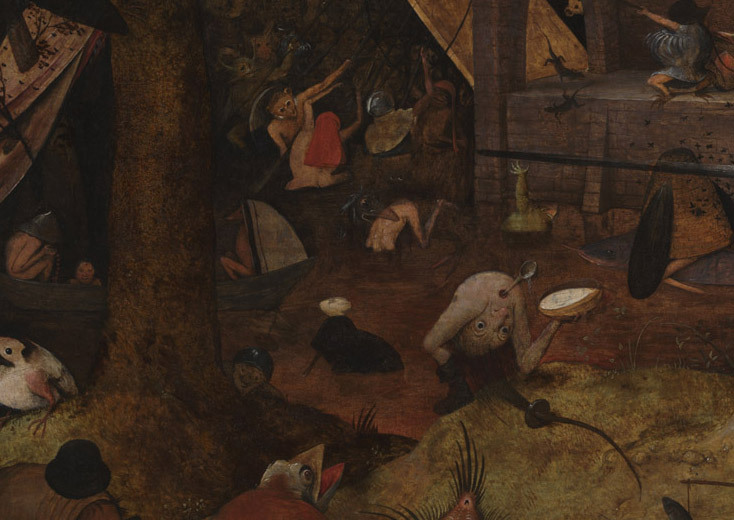 ‘Like a director of horror films, the painter tried to appeal to all the senses in order to arouse fear and create pleasure at the same time,’ writes Bruegel biographer Leen Huet. The painting takes its name from the woman you can see running to the left at the bottom of the painting, wearing some kind of armour. Compared with everyone else, she looks like a giantess. 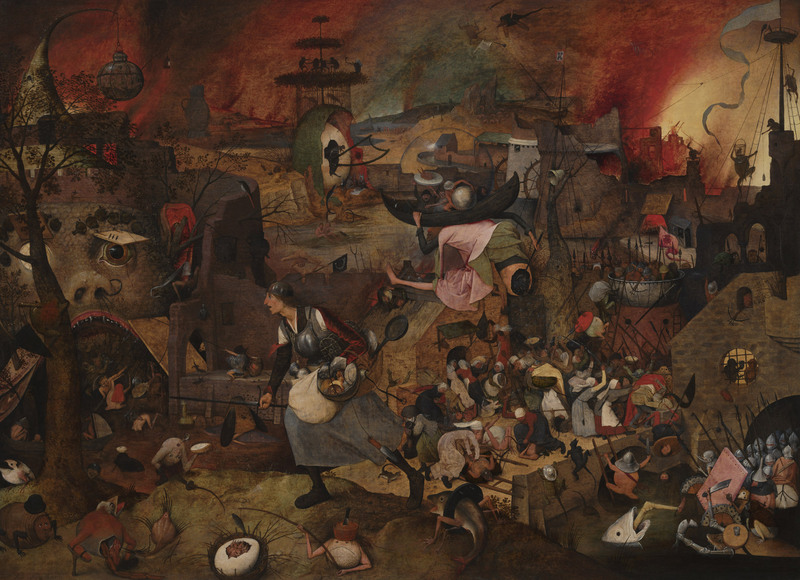 Mad Meg is running past the gaping mouth of hell. Behind her, women have apparently started pillaging. Male soldiers are entering the scene on the right and there are all kinds of bizarre monsters, strange creatures and weird structures. The horizon appears to be on fire. You couldn’t call this fascinating work light-hearted –chaotic would be closer to the mark. When Fritz Mayer van den Bergh had just bought it, the great specialist Max Friedländer aptly called it ‘a volcanic painting’. Much has already been said and written about Mad Meg. In general, the painting seems to be about the battle of the sexes. The male-female relationship has been the theme of comedies and other works of art since antiquity. 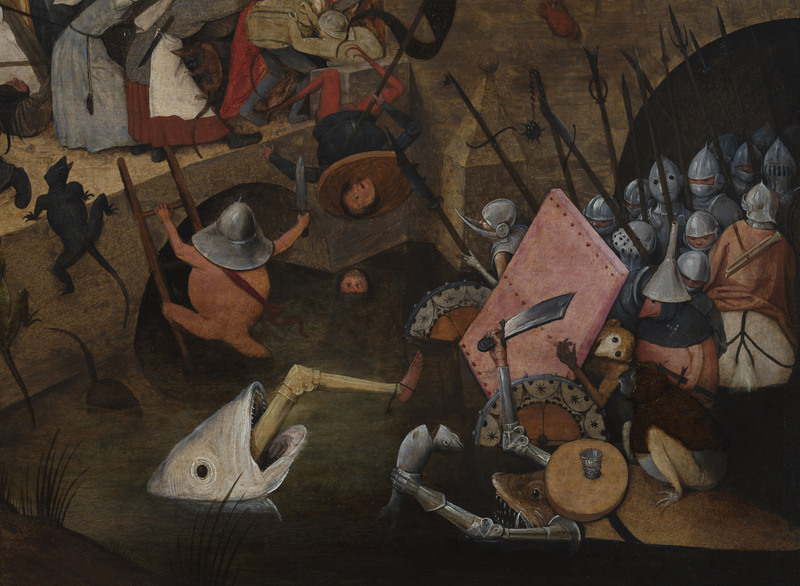 Bruegel let his imagination run wild and drew inspiration for this work from his predecessor, Hieronymus Bosch. The painting also depicts a kind of topsy-turvy world: the women wear the trousers.